International Data Privacy Day is right around the corner and to mark the event we’re happy to announce that Firefox Focus, the privacy browser, is now available for iOS in 27 languages covering billions of users around the world. Mozilla’s community teams hustled to localize all these language versions in time to hit an aggressive launch timetable and we are so grateful for their help. This means that a huge chunk of the world’s population can use Firefox Focus in their language to browse privately, leaving no trace and keeping their thoughts and online activities confidential. Today’s version launch of Firefox Focus is part of our ongoing drive to give users more control over their web experiences. After we launched Firefox Focus, we saw there was a huge appetite for private web browsing that allows users to erase their web history with a single tap. 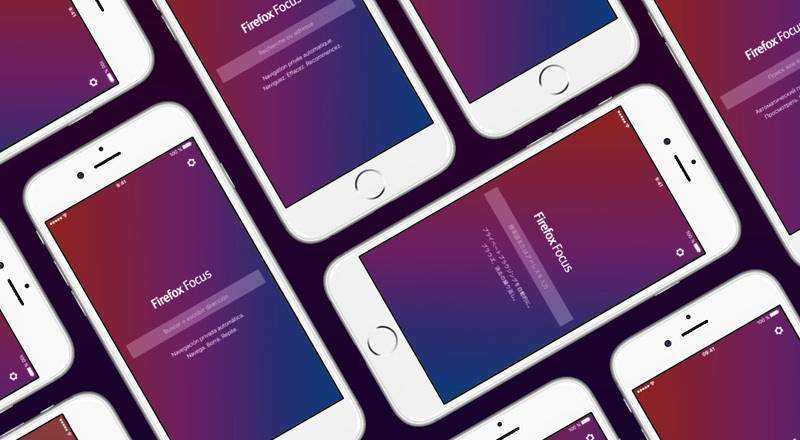 After serving up many millions of searches on Firefox Focus, we wanted to give users the choice to use it in their native language. For Mozilla, which has always prioritized inclusiveness and community value, this was a no-brainer. So if you want to browse privately in Arabic, Azerbaijani, Czech, Welsh, German, English (United States), Esperanto, Spanish from Chile, Spanish from Spain, French, Hungarian, Indonesian, Italian, Japanese, Kabyle, Dutch, Polish, Portuguese (Brazil), Russian, Songhay, Slovak, Slovenian, Swedish, Turkish, Ukrainian, Simplified Chinese and Traditional Chinese, among other tongues, we’ve got you covered. We’re not done, either. We will continue to work with our community to add new languages to the app. We’re all about giving our users the choice to change the default settings on Mozilla products and customize their browsing experience. That’s why we have also added the option for Firefox Focus users to change their default search provider. This is similar to the experience on Firefox for iOS and Firefox on Windows or Mac desktops and laptops. We know from copious user research and constant community feedback that being able to browse the web without stressing about being tracked or served unwanted ads is a big deal. It’s why many of them chose Firefox Focus in the first place. It’s why we built Firefox Focus. And for International Data Privacy Day, we’re particularly proud to extend always-on privacy and the beauty of the really big “Erase Button” (see the upper right corner screen on Firefox Focus) to many more people around the world. We will continue to listen to our users to see what matters most to them and add new features that will give them the most secure web experience.